Location: The lake is located at the southern end of Nimpkish Lake. 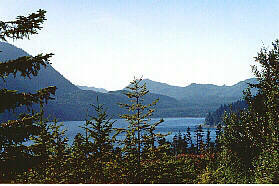 Access is found via secondary road 48 km (30 miles) south of Port McNeill. Resorts & Campsites: The campsite and sandy beach are available for visitor use. Fishing Report: Rainbow trout is the most abundant game fish in the lake. Wolfe, Atluck and Anutz Lakes all drain into the larger Nimpkish Lake. Roselle and Bonanza Lakes are also located nearby.